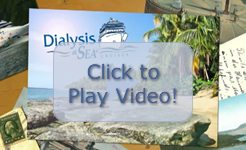 What does Dialysis at Sea Cruises do for you? Dialysis at Sea Cruises offers dialysis patients and their families, "Freedom". Freedom to explore and visit some of the most exotic destinations once thought impossible to do as a dialysis patient. Freedom to relax, with the piece of mind knowing a team of trained renal care specialists will be cruising with you. Freedom to live out your dreams while awakening a sense of travel and exploration once inhibited by renal disease. You can now travel around the world with family and friends in comfort knowing your dialysis needs will be taken care of by caring and dedicated medical professionals. No longer will you have to wonder how to travel while on dialysis, the only question will be, where are we traveling to next? Learn more about dialyis services aboard your next cruise! What does Dialysis at Sea Cruises specialize in? Dialysis at Sea Cruises specializes in the treatment of hemodialysis care while onboard cruise ships. Hemodialysis patients have undergone renal failure and must be dialyzed with an artificial kidney to rid the body of fluids and toxins. Dialysis at Sea Cruises provides a renal care specialist team consisting of a Nephrologist, dialysis nurses and certified technicians. 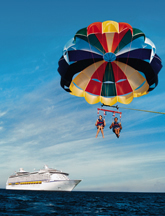 We sail on select cruise sailings with Royal Caribbean and Celebrity Cruise Lines. We provide the most advanced equipment and supplies which are housed and maintained with Dialysis at Sea Cruises and undergo strict maintenance protocols for the most optimum performance. Dialysis at Sea Cruises is the largest provider of dialysis services aboard cruise ships in the world. Since our inception in 1977, thousands of individuals on dialysis and their families have been able to experience the pleasures of cruising and the excitement of taking their dream vacation. Travel with us in confidence as all of your shipboard medical needs are handled by experienced and trained medical professionals. Dialysis at Sea Cruises is offering our medical staff the opportunity to experience the excitement of cruising to majestic ports of call throughout the world while enabling the dialysis patients the freedom and confidence to cruise with the knowledge that qualified and trained professionals will be traveling with them to care for their shipboard medical needs. Dialysis patients can cruise with family and friends on their dream vacation, with the assurance that their dialysis treatments can be provided onboard ship throughout the world with the assistance of our trained medical staff. Learn more about joining our team! Learn more about Dialysis at Sea Cruises and dialysis services aboard your next cruise. Receive emails from Dialysis at Sea Cruises about sailings, special offers and events!